Reviewing this game has been a learning experience on my part. 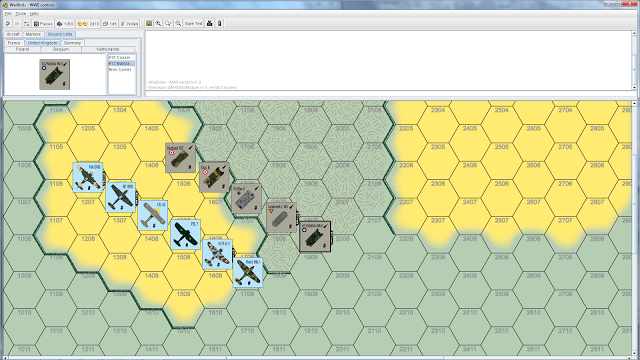 It is a print and play game that also comes with a Vassal module built in. I had only dipped my toe at times down through the years into Vassal, so for this game I had to get into it down to the nuts and bolts. This game goes back to an earlier age where computers and all our new fangled doodads didn't exist. With all of our new games and plane simulations etc. why do we need to go back to a board game like this? The reason board games of any type are still around, and not only that are thriving right now is because of the game play. You will see during this review that this game is intricate, but fun, and that as a simulation of early WWII war in the air it works. You will have to read (shudder) and not just click a mouse. The game is fairly long on rules, but for gamer's who have played ASL or the original it is nowhere near as bad/good depending on your taste, and masochistic tendencies. The game is based on what a pilot could do in in 4.1 seconds of real time. The length and breadth of the rules are because of the physical constraints of using one dimensional maps etc. to simulate everything a plane could do in three dimensions. In order to recreate dogfighting and ground pounding the player has to understand how the rules allow him to not only fly loops, but also do an Immelmann. The index of the rules takes up four pages (there are also a lot of optional rules to immersive yourself further). This is not to scare you off, but just to make sure you understand what you are buying into. The rules are sixty-one pages long, but it does have a lot of illustrations. After that there comes more rules for playing by PBEM, and then reference material, and then an alphabetical index. With the rules in PDF form it is very easy to have them open on a tablet or phone. So you won't have to print them off unless you want to. They are clearly written without ambiguities to argue over. The game rules are intuitive so without to much checking you will be up and flying and fighting in no time. The game comes with twenty-four maps, and thirty three scenarios. 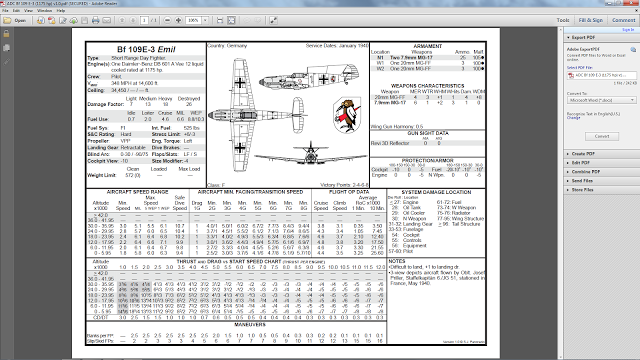 The print and play version has very nicely done graphics, and the Vassal components are top notch. The manual is well setup to learn all of the different things you need to know in an ABC method. The game is actual in two parts, there is a tactical part, and also an operational one. 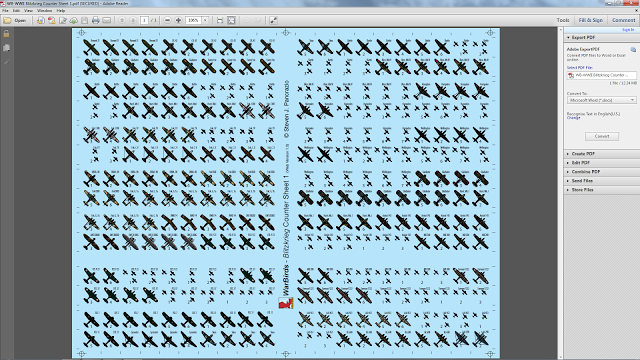 The tactical part is you flying your plane(s) over the different mapboards. The operational part is one where you are a flight commander, and are responsible for carrying out different missions. 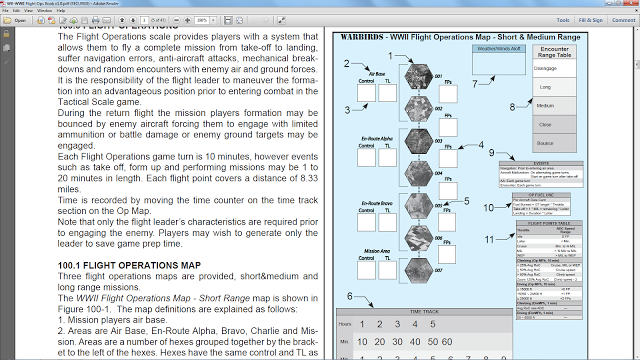 The operations part of the game has its own separate rule book. 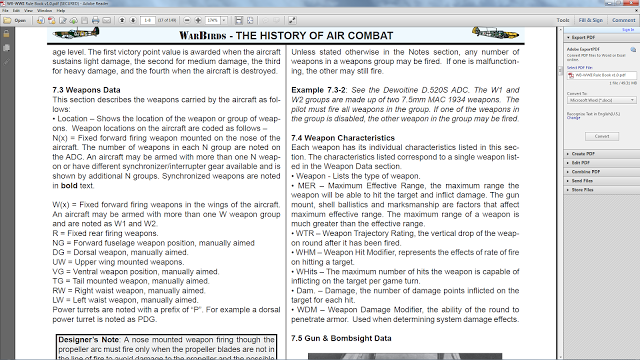 The written material includes designers notes, and tons of background on air warfare. The rules are full of illustrations to show how they are to be utilized in the game. 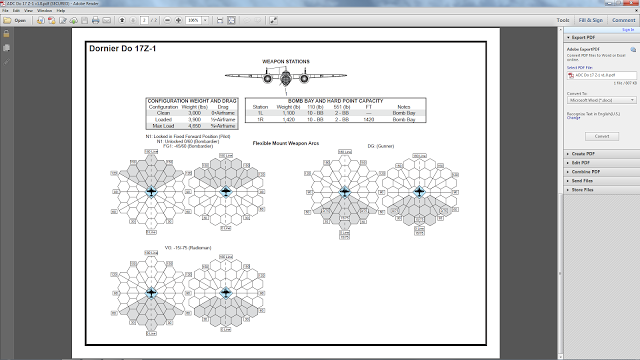 The plane charts are a marvel all by themselves. By studying them you really get the 'feel' for the different planes. What you get for the price of $30.00 is pretty amazing. 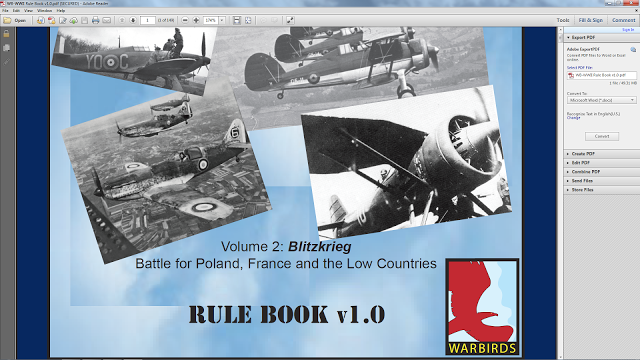 The fact that once you have the rules down they can be used in any of the other games in the series from WWI to the present is a tribute to how well the rules actually convey air warfare. 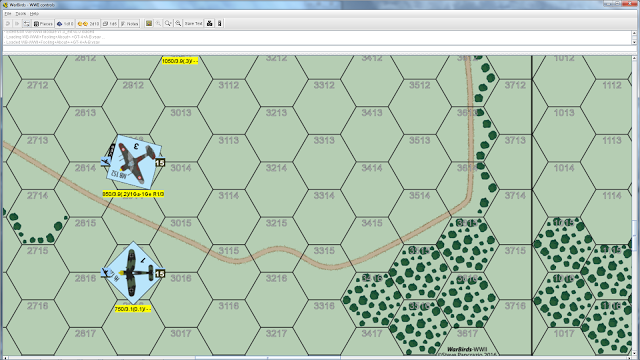 I have started following along as some players use the PBEM system with the Vassal module. It seems to work pretty seamlessly. The games system started out as just a WWII addon for another flying game. The idea is just about twenty years old. Steve Pancrazio is the brain behind the games. Mr. Pancrazio has a background in engineering and aviation. He started playing board wargames in 1974, Avalon Hills 'Luftwaffe' to be exact. He decided to self publish his games in 2014, and the first one is called 'Canvas Falcons' and it has a good following on boardgamegeek etc. As I stated earlier, he was trying, and succeeded, in developing a flight game that could be used in different eras without having to learn a whole new set of rules for each new era. 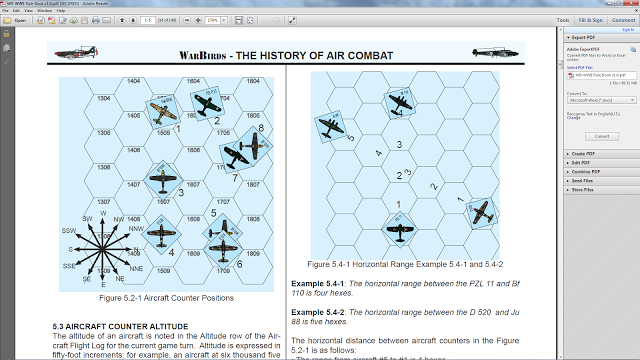 If you look at the rules for 'Blitzkrieg', and compare them to 'Canvas Falcons' you will not see too many differences. 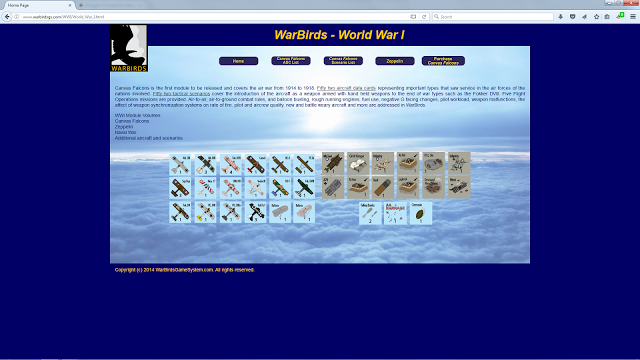 The next release will be 'The Battle of Britain' for which he is finishing the naval rules right now. 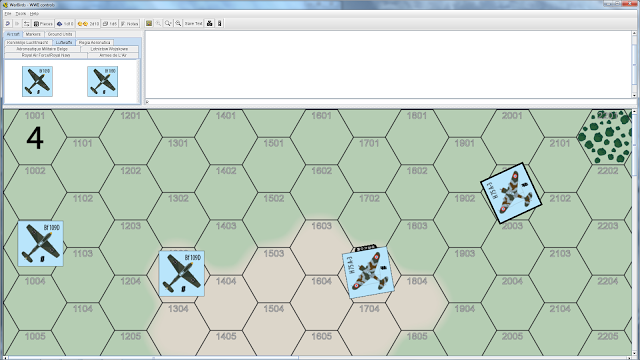 After that it is on to 'Forgotten Wars', and then he will add a Zeppelin module for 'Canvas Falcons'. As a teaser there are aircraft data cards on the website for 'Forgotten Wars' one is a Mig-15 and the other an F-86. For those of you who want a physical copy there is the print-n-play version, which comes with the game. 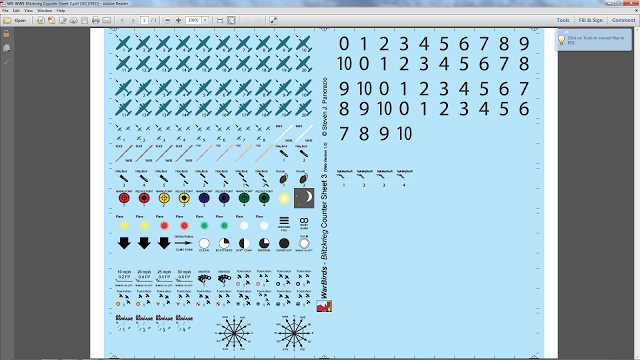 Their are more than a few good websites that can teach you how to make your own counters and maps, along with instructional videos. There is so much here that I really wanted to show, but cannot because of only having so much space.